Last night was cheese night!!! 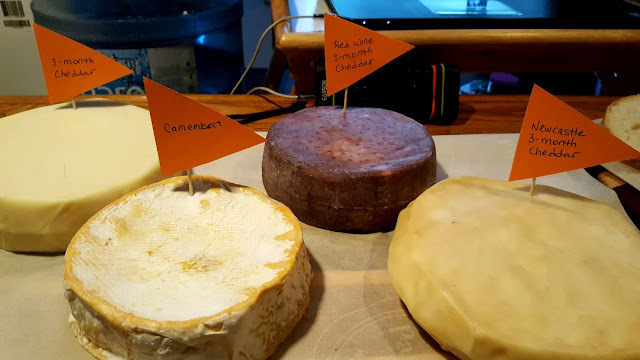 I have to admit I was nervous to try out my little dairy children...The Cheddars were all 3 months old and the Camembert was made in November. All seemed normal, except my Cam turned into a creamy gooey mess! Let's hear the bad news first. 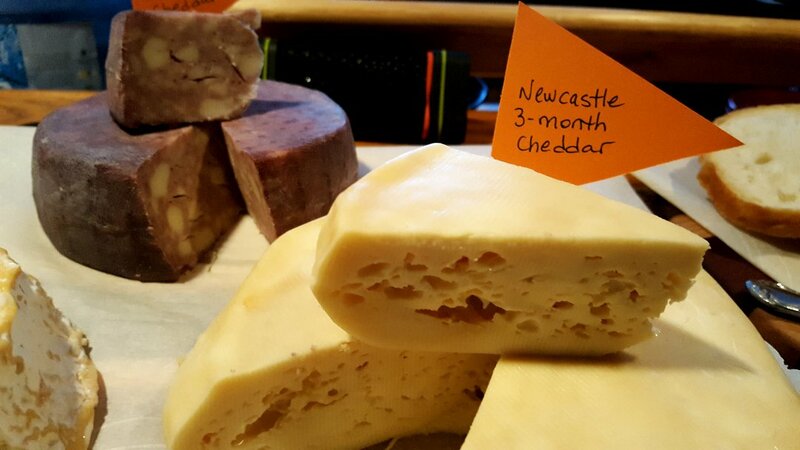 The Newcastle infused Cheddar? Not so good! Maybe the beer didn't mix well with the bacterial culture...who knows, but it had hardly any flavour with an odd after taste. But my head is high...it's the only one that didn't turn out! The regular Cheddar was nice! All of the Cheddars had a great texture. This one was very tangy - Alex loved it but it was slightly too tangy for me. Again, I have to research how to make it a little more mild. Tweaking here and there and more experimentation is needed! MY favourite! The red wine infused Cheddar. It turned out nice and mild and look at that marbled effect! Oddly enough, this is the only of the three that grew a hard rind too. More mysteries!! I made some bread to go with the cheese. Check out my lonely little slab of paté!! Conclusion: I WILL make more Cheddars for sure. Now that I know they have good to improvable flavours, there is no stopping me! I will also make more Camemberts. I want to try some new cheeses in 2018 as well. I will keep making some of the cream cheese, the Boursins, Ricotta and Mozzarellas (traditional and Bocconcini style). I still have the Dry Jack in the cheese cave as well as the experimental Baby Swiss...we'll try both of those in the spring! I do have to acquire better equipment though. Better shaped cheese molds and maybe some newer bacterial cultures. 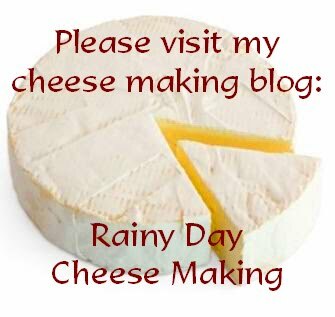 My Rainy Day Cheese Making blog should be more active in 2018, so keep an eye out! Thanks for all of your support this year on my cheese making my friends, it's been a bit of a rollercoaster! Oh I am sure that was a DELICIOUS gooey messsss!!!! I-am-sure!!!!! 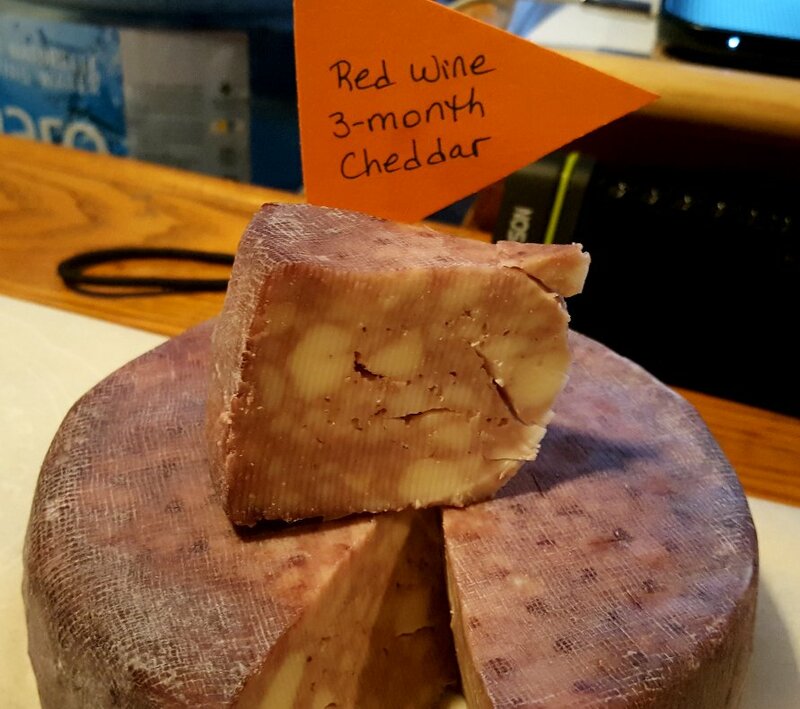 That red wine cheddar, have never seen that before! Sounds delightful. 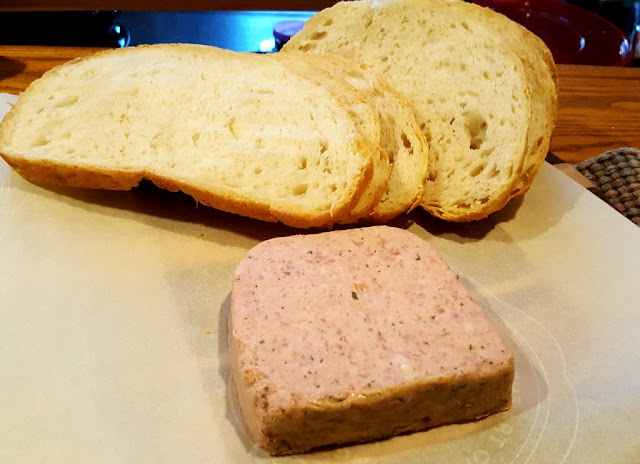 that bread and pate look yummmm tooooo. You do realize how "painful" this post is, for me, don't you? >,-) No, you don't! :-) I can not eat gluten, and very little lactose. Really! I'm not just on some yuppie fancy eating kick! I had all kinds of gut issues, for years. !!!! A few years ago, I quit gluten and.... All my gut issues disappeared!!!!! Yes, life without gluten is not fun. But life without gut pain and spending hours on the John, is wonnnnnderful! And yes, there are a lot of gluten free products now. But, for me, real bread, will never be able to be G/F substituted. Have a lovely New Year's Eve! I bet there is a Facebook group for cheese makers. I learned a lot from a Facebook group when I started making my own kombucha. There were books but I found the group had answers to my specific questions. Love it! How amazing is it that you can make that cheese to enjoy. You live in a cheese shop, it looks wonderful. Happy new year. Your cheeses look amazing, I am sure you have learned a lot too. Thanks for sharing, and Happy New Year Rain! Yum! I love cheeses, and I wish I had some of these right now. Thanks for sharing. Sounds like a successful run to me! You've accomplished so much in a relatively short period of time. It's certainly a challenging learning curve. And I look forward to you sharing more of this adventure. It's a lot of fun! 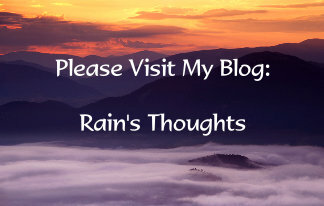 Hi Rain, it’s so good to read your blog again. I can't think of a more delicious hobby and I never knew it was even possible,, I thank you for introducing me to cheese making! So cool to have made your own cheese, amazing,, and it looks wonderful as well, I can't wait to see what you come up with next and I can't wait till the swiss is ready in spring,, thats exciting!! Yesterday I took advantage of the extremely cold weather to smoke some cheese in my little electric smoker. I've been wanting to try it for forever, but you have to cold smoke cheese (temps no higher than 90f, preferably under 80f), which either requires special equipment or really cold temps. Turned out pretty good too! Rain, you have really piqued my interest in cheeses. Now I know why some are so expensive. I went to my online used book dealer and wow!!!!!! Cheesemaking books are pricey! Even a used one starts over $20! I concur with an earlier comment....check to see if there is a facebook group for cheese makers. I am in several for different cooking techniques. Rain, I love your cheesemaking adventures! Never a dull moment, eh? I thought the gooiness of the camembert was typical of long aging (???) I've never made it so I don't really know! I'm sure the more you make, the more you'll understand the nuances. Lots of cheese goodness to enjoy! Happy New Year! These look amazing! Glad you had most success with your cheese endeavors. YAY YAY YAY!!! I have been on pins waiting to hear and this is incredibly good news! Onwards and upwards! happy new year! they sure look wonderful! i love following your cheese making! Wowzer! Those cheeses look fabulous! 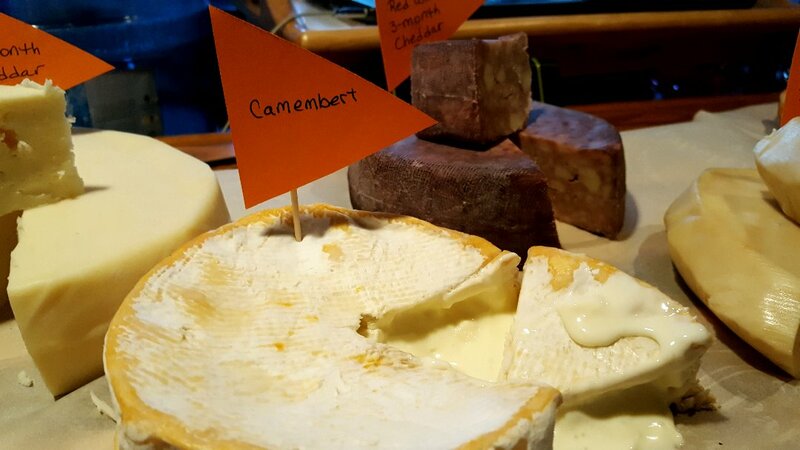 I wouldn't mind eating that Camembert with a spoon...yummo! It will be fun following your cheese adventures this year! Happy New Year, you two! 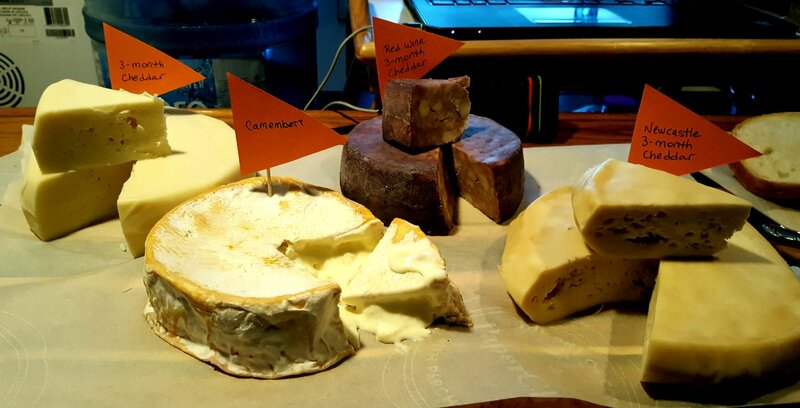 This post made me think of Monty Python's cheese shop sketch that features runny camembert! Happy New Years to you and Alex. What a treat. Everything looks so delicious. You must be very proud !!! Looks great and what an adventure!!! Your cheese making abilities leave me speechless. Seems you're getting so good at it in a relatively short time. I don't want to learn how to make cheese; I just want to eat yours. So interesting to see how they all have turned out! Hi Birdie :) I actually belong to a cheese forum, but I haven't been there in ages since we got the two extra dogs...I will have to go back there and ask for some advice! Thanks Pam :) It was great to taste them finally!! Hi Laurel-Rain :) I love your name :)) I love the cheeses, my fave was the red wine one. I've had some made with port before, I may try that next time! Hi Laurie :) We are REALLY looking forward to the Swiss and the Dry Jack!! It's a bit of a challenge because I don't have a real humidity and temperature-controlled cheese cave. My "cheese cave" is a small bar fridge that Alex gave up for my hobby. It's hard to keep it at 10 C and 80% humidity! But I'm trying my best...more cheese to come in 2018!! Thanks Stefanie :) I'm so glad it was a success too! I was really nervous! Thanks Dianna :)) Onwards and upwards definitely! But those Cheddars are really a lot of work, so I want to try to make them milder. I have to find a new recipe to experiment with I think. Thanks Susan :) I could have DRUNK that Cam right out of it's rind lol...actually I did pull out a spoon at one point! Hi Nik :) Happy New Year to you and G too! 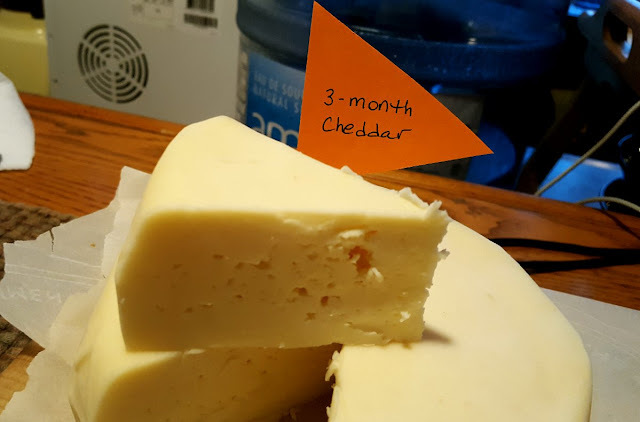 :) I'm really proud of my Cheddars :) I hope I have more good cheese news to share in 2018! Hi Becki :) The Cam isn't supposed to really be that gooey! It's supposed to be creamy but not runny. I'll get it better next time :) I can't wait to try making more cheeses this year! Oh, those cheeses look awesome and as long as it tastes good who cares if it's a gooey mess! LOL! I'm afraid to go over to your cheese blog as I have too many projects on the go now but someday I am going to do it! Meanwhile I will live vicariously through all your successes and you have so many! So happy they turned out and the red wine one does sound really tasty. Congratualtions and Happy New Year!!! Thanks Sam :)) Oh don't worry! I haven't updated the cheese blog for a few months. I copied this post over there, but the new cheeses haven't really started yet! Wow this variety of cheese looks so appealing dear Rain! i am so proud of you to do everything with so enthusiasm and perfection. happy new year to you love birds dea!!! Thanks Baili :) I'm looking forward to trying new cheeses again this year! I just need to find the time. It might have to wait though, until our friend picks up his dogs, they take up so much time!! Christmas - More Memories Made! Cakes and Decorations and Presents!